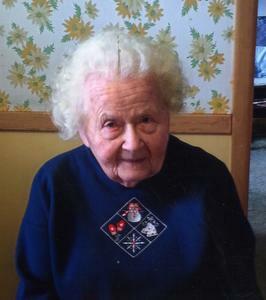 Delores L. Lomasiewicz, age 90 of Grand Rapids, passed away on Thanksgiving Day, Thursday, November 23, 2017. She was preceded in death by her parents, John and Helen Lomasiewicz; her sisters, Harriet Davison and Sally Drasiewski; and brother, Chester Lomasiewicz. Delores is survived by her brother, Edmund Lomasiewicz; nieces and nephews Diane Lusk, Robert Tuinstra, Ronald (Krystyna) Drasiewski, Janice (Thomas) Ayotte, Roger (Diane) Drasiewski, Karen Lomasiewicz, Amy Preston and Anne Lomasiewicz; many great nieces and nephews; cousins, Fr. Donald Lomasiewicz and Edwin Ferrence. Delores was a lifelong member of St. Adalbert's Catholic Church and attended St. Adalbert's Catholic School and went on to Catholic Central High School. She took care of her parents and was devoted to their care, having had a few jobs throughout those years. She worked at Wage Makers and also spent several years working at smaller factories in the area. Delores lived with her oldest brother, Edmund until her death. In her younger years, Delores traveled to Poland twice to visit her mother's family and also traveled to Arizona many times, and California. She loved animals, especially dogs and parakeets. She loved doing crossword puzzles in her free time and watching game and quiz shows on TV. She found great joy in writing and receiving letters and had a pen-pal she kept in contact with for many years. One of her favorite things to do was going to rummage and yard sales. Delores was proud of her Polish heritage and continued to keep in contact with her extended family in Poland by letter correspondence and telephone calls. She could speak fluent Polish. "Aunt Dee" was a wonderful aunt to her nieces and nephews and took great interest in their lives and families. She was truly loved and will be greatly missed missed by all. The Mass of Christian Burial will be celebrated on Saturday, November 25, 2017, 11:00 AM at St. Isidore Catholic Church, 628 Diamond NE. Relatives and friends are invited to visit with her family on Friday evening from 6-8 PM at Heritage Life Story Funeral Home - Alt & Shawmut Hills Chapel, 2120 Lake Michigan Drive NW where the Rosary will be prayed at 7:00 PM and again Saturday one hour prior to the funeral Mass. To share a favorite memory or photo of Delores and to sign her online guest book, please visit www.lifestorynet.com.